Thursday November 16, in partnership with Square Food Foundation. Enjoy a three-course banquet style dinner prepared by Square Food’s Barny Haughton and a team of 12 young budding chefs as part of my 25 year celebration exhibition. The evening will be an opportunity to bring people together and celebrate our wonderful city. Enjoy seasonal, local and delicious food, drink wine and hear about what Bristol24/7 is up to. 10% of the proceeds of all sculptures, drawings and paintings sold on the night will go to B24/7’s social impact agenda. Planning my 25 year exhibition I knew it had to be a Bristol celebration. I would not only show over 100 artworks in a cavernous space, I would aim for high tide, a swell, a gathering of folk to teach and to inspire so it leaves behind a rich residue of connections, ideas, and hopefully some money, to nourish new growth. I first came across the Square Food Foundation at a fundraising meal at Spike Island Café, Barny talked about doing cookery classes for people who didn’t know how to cook cheaply, or at all, it was a simple, human and inspirational idea. As often happens in our city, a chance conversation with B24/7 has helped bring these ideas together. Their social impact agenda is about many things, but to me it’s about making these types of connections and to help us all grow with each other. Below is interview I did with Bristol 24/7 about the event. Q. What is your connection to Bristol, and why have you based your studio here? In 1992, I had two commissions from my degree show and moved directly from Winchester to the Bristol Sculpture Shed. A few sculptors from Winchester were at the ‘shed’ so it was the studio that first brought me here. We all then moved into Spike Island, and then have been at Paintworks since it started over 10 years ago. Over the years I have had temporary studios in London and Barcelona, but Bristol has always been home. It is here that I have grown up as a sculptor. Q. Do you find that Bristol has been a good location for your artistic outlets? It seems ridiculous to like a city because ‘it’s the right size’ but as well as being geographically easy to navigate by cycle it’s got everything. It’s difficult to create in a vacuum, you need good quality inspiration and Bristol has that. There’s always plenty to see, do, hear and of course taste – it sounds horribly hipster but I love the fact that I can go to a poetry evening, get a locally brewed pint and buy a loaf of bread all at the same time. Q. We’re celebrating your 25th year: what have you learned over that time, and do you have any tips for budding artists? As my tutor at college said, ‘it’s just a f…… job’. He had a really annoying habit of being right a lot of times. What I think he was saying was don’t get all artsy-fartsy about making work, just get on with it, treat it like a job and get up every day and do it. I left Winchester School of Art with determination and passion but I am afraid what they forgot to add was confidence. I didn’t rush my portfolio around the London galleries, I aimed low, as that is what I believed I was worth. I framed some drawings and prints, made cards and took them to a car boot fair. Literally, people looked at me as if I was mad, but it was a start. You are the way you are but over time you recognise your traits more clearly and I realise I have always been both overly insecure and independent, I never want to ask for help preferring always to just get on with it. After 25 years I realise that this is both my weakness and my strength. All you can do is work with what you’ve got but as my tutor said, you do have to work hard and put the hours in. Q. What message are you trying to pass on to younger generations, and why do you think it is important? I wouldn’t be so bold as to try and say I had a message but I could say it helps to look, work hard, believe in yourself but not so much as that you can’t see. And never be afraid to start. Q. Through the Autumn Feast, you’re choosing to support the Bristol24/7 social impact agenda – what does it mean to you? I had a bit of a tricky spell as a teenager and ended up homeless, having ‘no fixed abode’ you suddenly find yourself on a very slippery slope but I was lucky enough to have been taught to cook. Having nowhere to go in the evenings and no money I used to sit in the pub drinking water, eventually the landlord said I could use the kitchen upstairs. It was a bit of a rough pub so he was happy to let me have a go and try and ‘improve the clientele’. I set up my own business doing lunches (it was too hectic in the evenings). It was a slow start, someone would order something at the bar like a sandwich and I would say ‘won’t be a min’. I would take the money for the order and run out the back of the pub to the shop and buy the stuff to make it, it escalated from there until I had enough money to make proper food and Sunday lunches. One Sunday lunch when I had all my happy customers eating roast beef and Yorkshire puddings someone had issue with the landlord and a fight broke out, ashtrays were thrown at the optics and glasses were being flung about the place. It kind of put a bad vibe on my ‘family lunch’ location but it got me ‘off the streets’. So, you could say food saved my life! The experience also helped me realise that not everyone can make it, can change the road they are on, without a lucky break and a supportive helping hand. When Graham and I set up the Bristol Drawing School we never asked anyone to help or permission to set it up, he is also very independent and so we just went for it. We did some great things with the school that we are proud of, but in the end it was a lot for us to take on our own, and eventually we moved it to the RWA where it is a pleasure to see it still flourishing. What I like about the Bristol 24/7 approach is the way it’s about making connections, all those people and organisations, like the Drawing School, that are battling to do good things on their own are being brought together. The feast is perfect example of this, people have been really happy to help and work together to make something bigger than any of them could do on their own. Q. 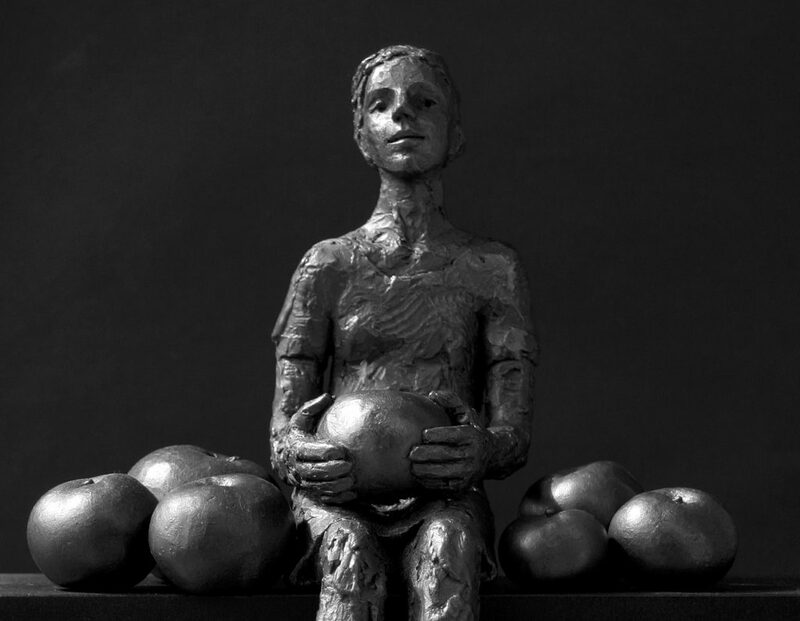 As part of the Autumn Feast, your ‘Eve‘ sculpture will be auctioned. What made you pick that one? A few years ago, I was at a Justin Townes Earle gig at St Bonaventure’s, and someone shouted a song request from the audience, he just looked at them and said, ‘don’t tell me what to do’, and it made me smile for weeks. This piece has Eve sitting there with all those apples, and no one is going to tell her what she can or cannot do with them. What has been your proudest working moment so far? It is usually about sculptures I have made rather than the achievements of those sculptures to get to certain places. My ambition is within the greatness of the achievement within the piece rather than the position it has raised the artist to. A good feeling is to make a painting or sculpture and then after, when all the worry, indecision’s and insecurities have gone, when you become slightly detached from it through time you wonder how you did it and worry terribly that you could never do it again. But usually I am very critical of past work and therefore satisfaction is limited. What is the most important thing you like to express with your art? The most important thing with my art is honesty, sometimes I can be too cheesey or potentially naff, I worry I don’t hide my personal feelings enough and can be a bit blatant but I always use the excuse that I am being true to how I feel, its just me. It is what it is. If you are not honest there is absolutely no point.